This past Tuesday, HBO aired a piece on "Real Sports" called "Unnatural Selection" which sent the purebred dog community into an uproar. The segment shined a light on the often overlooked poor health and breeding being done, and the purebred people had a response (see below). Notice when it comes to the part about why the AKC does not require health screenings from breeders or in dog shows (5:09), the man in the video says if breeders simply "follow the breed standard" you automatically have a healthy dog. *The American Kennel Club has a program called "Breeder of Merit" which is SUPPOSED to reassure you that a particular breeder is ethical and doing all they can to produce dogs that are healthy through screenings for their particular breeds being produced.. Unfortunately, participation in this program is completely by choice and in no way mandated by the AKC. Also, once a breeder is named in the program, they appear to possibly neglect to ensure these screenings are in fact taking place. Their application says "be prepared to supply proof upon request". Seems there should be stricter regulations in place to become AKC registered. *Breed standards have in fact changed over the years. The people in this video claim breed standards have been in place for hundreds of years, but they only talk about the bulldog. What about the German Shepard, for example? German Shepards, who once had straight backs now regularly have roach , or curved, backs. These changes have caused problems with balance, back legs, and hip dysplasia. Standards have changed in many other breeds as well. The Pekingese is another that has been "adjusted". They once had larger skulls, longer legs, and longer noses. There were some crosses between Shih Tzus and Pekingnese to "correct" these features and what has resulted are many shorter nosed dogs with severe breathing issues. Unfortunately many breeders deny or downplay the health issues that have cropped up from this selective breeding. The good news is that there are many good intentioned people are out there working on health committees within breed clubs trying to better the health of their dogs. They're encouraging genetic testing, no inbreeding and eliminating extreme breed characteristics, but that's all they are...words of encouragement, not yet enforced. *Required health tests that screen and judge the vigor of breeds in dog shows should be put in place. Currently dogs are judged on appearance, movement, temperament, height, weight, coat, color, eyes, ears, feet and tail. Health and fitness standards are not part of the criteria for judges. So, we might have some really good looking dogs with serious underlying health concerns. Then those award winning dogs go on to fill the demand of passing down their beautiful, possibly unhealthy genetics. This was the case with the Golden Retriever and now the sheer amount of cancer within that breed. *It's important to actually SEE your puppy and it's parents before purchasing from a breeder. Pet stores are never the place to find your new pup. Make sure your breeder is doing the proper health screenings for their breeds. There are MANY ethical, good breeders out there doing exactly the right thing for the health and betterment of their breeds. If a breeder is not your game, then of course a great option is RESCUE! 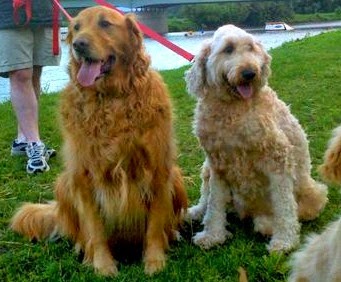 *Obviously I own a Goldendoodle, or as many would say, a mutt! I do understand many look down upon that kind of hybrid breeding. Yes, while this dog came about from mating two different breeds, what many people don't realize is that many purebreed standards came about with "mix ins" from other breeds. My breeder did do health testing and I felt she was conscious about the health of her pups. *I am not in any way judging how people get their dogs. I'm just in favor of better health and longer lives for our beloved pups. My "purebred dog" and my "mutt"
Well said, we had the chance to see Sidebite at three weeks and meet his parents and see how they acted and review their health. We also took the time to get to know the breeder see all of her operation and how well she took care of the dogs. We believe knowing all we could gave us the best shot at a very healthy puppy! I agree with you for the German Shepherd, sometimes I could cry when I see this dogs on shows. It's so sad what some breeders do for a better look of the breed, instead to breed healthy pups. I'm glad that we have responsible breeders too and I hope people who plan to buy a dog will make the right decision. Here there has been a backlash at Crufts for that reason. People here are starting to dislike the breeding of pure breeds at the expense of health and we agree.Have a serene Sunday and let us all partake of some big easy today. My breed, Chesapeake Bay Retriever, is based on an outcrossing from the Newfoundland, and, it is believed, Otterhound, Flat Coated Retriever, and the Curly Coated Retriever, I was raised with my pawed parents and grandparents. In addition to my pawed mom and pop having proper health screening, I had the screens too and my Humans got copies of all, along with my papers when I came to live with them at 14 months. Healthy is what we should all be striving for, for our pups and us. The kennel clubs should be setting the standards for everyone else. #1 is healthy and we are healthy mutts! Well said. I know there are some responsible breeders but also some only in it for the money. I read an article that compared many breeds... 100 years ago to current looks. So many "deformities that cause problems like ability to breathe, to reproduce on their own, the list of problems goes on. Reminding people to do the research and either buy from a reputable breeder theY have checked out or go thru a rescue.